This statement was originally issued via Twitter on 19 May 2018. This post is a expanded reproduction of those tweets, updated to reflect new developments. It is solely the opinion of the author and does not represent any third parties. I would like to address all of my followers on the many titles currently being considered for depublication from Steam over concerns of suggestive content. I must begin by emphasizing that the following is solely my own opinion and does not represent any third parties. I have chosen to issue this statement on Twitter directly rather than my personal blog to maximize visibility. This is a statement focused on how the ongoing situation has affected me personally. Valve’s initial decision to recall mature titles it has previously deemed suitable for Steam by 31 May 2018 has inflicted unprecedented hardship on impacted developers and publishers. The most notable of these developers include Lupiesoft (Mutiny!! ), HuniePot (HuniePop), NEKO WORKs (Tropical Liquor), and MangaGamer (A Kiss For The Petals, Kindred Spirits on the Roof). The implications it presents on relationships with the operators of largest digital storefront have been discussed at length. 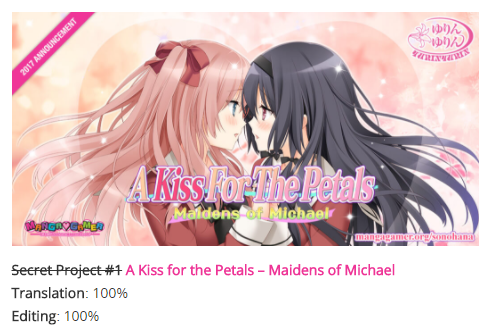 However, as the localization supervisor for A Kiss For The Petals – Maidens of Michael, currently the only title in question not available on Steam, I feel that my situation is unique and must be shared as widely as possible. On 28 April 2018, I issued a statement on the depublication of A Kiss For The Petals – Maidens of Michael on 8 March. As of this writing, no further progress has been reported on efforts to reinstate it. I felt a sense of responsibility as my foremost work in the visual novel field became the subject of controversy after two weeks on Steam. The same fate loomed over a multitude of works from multiple companies, and that feeling multiplied tenfold. While no link has been demonstrated between the removal of Maidens of Michael on Steam and the threat of depublication of titles that have been similarly marketed for mature content, there are too many parallels between these situations to ignore. The very possibility that the controversy with Maidens of Michael resulted in this situation renewed the feelings of remorse I had with the former. I was once again overwhelmed with anguish over a situation defined by uncertainty, and I withdrew from social media again. I can only hope that my followers deem me deserving of their forgiveness for this repeated silence mere months after a similar situation. With all of this said, I must add my own observations to this matter. While it is easy to conclude that the potential fate of the newly threatened titles could have mirrored that of Maidens of Michael, there are distinct differences between the two scenarios. Maidens of Michael was retracted from sale by Valve Corporation on 8 March with no prior notice or a formal reason for this decision issued. After over two months, there have been no responses to MangaGamer over the possibility of reinstating it. MangaGamer informed customers of the depublication via a tweet on 10 March and a later full statement on their staff blog on 9 April. There has been some coverage of the incident with Maidens of Michael on Steam by enthusiast websites, but no press whatsoever from any major publications that cover electronic entertainment. By contrast, Valve issued an ultimatum via e-mail to multiple developers, including MangaGamer, to revise the content of many releases by 31 May. The stated reason for this is “reports of sexual content”, which many believe were not made in good faith. These developers made this sudden decision public at once, and their customers quickly acted to protest it. The most publicized responses are from developers who refuse to comply with demands to delete content and those who point out that very high-profile titles (Grand Theft Auto, The Witcher 3) are seemingly exempt from said reports. It is this aspect of the situation that pains me the greatest. All of these titles were given a large window to rectify perceived infractions of Steam content policy, but Maidens of Michael was given no such chance. Maidens of Michael has been damaged the greatest by Valve’s decisions, but the lack of warning for its removal has also resulted in it getting the smallest amount of support from customers and the media. I fear it may never get the redemption these other titles are working for. The decidedly more publicized titles targeted by this new decision have been covered widely in multiple major news sources, including those that do not regularly cover mature content from Japanese developers or inspired by Japanese media (Destructoid, Gamasutra, Kotaku, PC Gamer, Polygon, Rock, Paper, Shotgun, Siliconera). As a result, they are rapidly gaining support and awareness while the first title to suffer this fate remains largely unknown to the public. Of the news sources listed above, only Destructoid has given mention to Maidens of Michael, by virtue of reaching out to MangaGamer directly. This is currently the only public mention of A Kiss For The Petals in regard to this situation and any prior removal of a title from Steam for sexual content. On 20 May, updates were issued by all developers involved that Valve has retracted the order to modify the content of the targeted products and to await manual review, but the situation with Maidens of Michael remains entirely unchanged. All communication from Valve has been through messages to developers, rather than any public statement from Valve directly. This has allowed the developers to relay the status of their works directly to their customers, and it is these reactions that have been reported by the media. Indeed, the reversal of Valve’s initial order was widely celebrated and discussed by fans, though as of this writing a final decision regarding these works has not been issued. No further communication from Valve regarding Maidens of Michael has been reported since 8 March. The question on why these works were given an opportunity that Maidens of Michael has been definitively denied was too crushing for me to contemplate. Many individuals have worked actively to protect their work, but I have not been so fortunate as to even be allowed to try. Even if all of these titles should ultimately face total removal from Steam at any point in the future, their efforts in resisting it will be remembered by the media and the customers. As these works enjoy renewed publicity as a result of this entire saga, I will have nothing to show for my own work except this admission of resentment over my inability to do the same. I sincerely apologize that my sole contribution to the discussion of the future of mature products on Steam is an account of personal grief and envy. I sincerely apologize to the developers who had been affected, for my support for your work has not been sufficient. I wish the best for your endeavors in standing for your work, even if it will mean eschewing Steam entirely. As I wrote on my previous statement, I am contemplating what my future in the field of visual novels should be, and how the value I placed in A Kiss For The Petals should continue to affect me in light of these events. With this latest development, I fear the search could continue indefinitely. The following is the opinion of the author and does not reflect the views of MangaGamer or any other third party. On 8 March 2018, A Kiss For The Petals – Maidens of Michael was made unavailable on Steam after only 14 days on sale. No notification was given to the customers, and MangaGamer has stated on 9 April 2018 that there has been no progress in communicating with Valve Corporation to address their objections, or even what they could have been. For my part, I have remained out of the public eye due to the extremely sensitive nature of this incident, and I did not make any statements for fear of causing further damage. Rather, I relied on MangaGamer to provide a statement of their own as I am not privy to the details of their talks with Valve, and I did not want any statements from me to misrepresent their ongoing efforts. Nearly two months have passed since the depublication, and all hope for speedy resolution has expired. I believe a personal statement on my own perspective on these events is long overdue. As I have stated several times in announcement posts, Maidens of Michael is my largest project in all respects. With consideration that my work on it began in May 2013, several years before I joined MangaGamer, it is also the longest single effort I have undertaken, professionally or otherwise. The journey to secure the English localization license incurred great personal expense to me, which included travelling to Japan and meeting with the production staff of St. Michael Girls’ School in February 2016. With the announcement that it would be published on Steam in August 2017, I focused the majority of my energy and resources in the final months of the project in preparation of the Steam launch. In those months, I modified the project to support an adult content patch, which was added to the project specifications after MangaGamer received clarification from Valve on their content policies. This was a challenge to implement in a short timeframe—I followed content standards established by MangaGamer’s previous releases on Steam and focused on avoiding major disruptions to the narrative. Though difficult from a technical perspective, it was easily justified by the much larger audience it would afford us. It must be emphasized here that MangaGamer did their due diligence and the final build was reviewed and approved by Valve prior to release. In a single motion, all of that concentrated effort was rendered void with Valve’s unexpected decision to remove Maidens of Michael from Steam. For all of the work by MangaGamer staff and myself in publishing Maidens of Michael to the largest digital marketplace to be undone so effortlessly, and for the excitement and passion from fans to be so quickly replaced with anger and confusion, was devastating to me personally. The impact to me has only worsened with each day that passes with no action taken by Valve to seek remediation. In the days immediately following the depublication, I had been very sparse in posting to all of my public channels, as little information was known. I was asked on every channel, public and private, from both fans and fellow developers, about the situation. With no information that I was at liberty to divulge, I felt that I had no option except to disregard all such messages. In spite of the senders’ good intentions, the mounting volume of these inquiries served only to trouble me. After a month of near-total silence on the matter, MangaGamer made their own frustrations known in a statement issued on 9 April 2018. In response to this potential explanation for the reversal of Valve’s consent to sell Maidens of Michael on Steam, the leading sentiment from both fans and other staff members was enmity toward those responsible within and outside of Valve. Regrettably, a side effect of this is that fans have also been quarreling with each other over factors such as content standards and questioning the merit of A Kiss For The Petals in the larger English visual novel market. I feel that such invective is counterproductive to the goal of reinstating Maidens of Michael on Steam and can have negative effects on the community for A Kiss For The Petals in the future. I will not share any desire to bear grudge against any party in public or in private, nor will I ever endorse any statements or actions to that end. With that said, as has been pointed out in several places of discussion, Maidens of Michael is currently the only title published by MangaGamer on Steam to be subject to this situation. (It remains available on MangaGamer.com regardless of its status on Steam.) Many titles with similar content and themes from other publishers continue to be available on Steam, including new publications since 8 March. Since the removal of Maidens of Michael from Steam, MangaGamer staff has collaborated with high urgency to seek a solution, but I found that any actions I could have taken have already been done by staff in more privileged positions than me. This realization, combined with my inability to assist in substantial capacity, left me feeling severe guilt, and it affected my ability to act rationally in response to every development. I was unprepared for an incident of this nature, as I believed that the only adversity I would face in the visual novel localization field would be negative reviews. The ramifications of such naivete have struck me to my core. I have concluded that the primary cause of all of these dilemmas is my singular focus on A Kiss For The Petals. I have since come to understand that my level of fanaticism for a single series has hindered my ability to maintain a rational stance. Ultimately, I now feel that my uncompromising loyalty to A Kiss For The Petals had been misplaced. My zeal in presenting Maidens of Michael to an audience unfamiliar with A Kiss For The Petals caused me to attach myself deeply to my project with no regard for my own safety. Regardless of how this incident concludes, it will be a black mark on the history of A Kiss For The Petals, and it is only through this that I have learned the dangers of involving myself with its growth to the extent that I have. For all of these reasons, on 10 March 2018, I took an immediate hiatus from all public internet activity—a drastic action, but one I felt was a necessity to protect myself. However, in the intervening weeks, the weight of this incident did not relent. Where the staff of MangaGamer have shown incredible strength during this predicament, I have been overwhelmed with uncertainty and anguish over the setbacks inflicted on my largest single project in my lifetime. During this period of silence, I have been forced to re-evaluate the value of A Kiss For The Petals to me, the investment I place into all of my projects, and my future in the visual novel field. These are questions that I did not believe I would need to have answers for, and I must now begin to seek what these things will mean to me going forward. I believe resolving them will reveal to me the reasons I continue to feel such crippling heartbreak, as I have for the last two months. I have written this statement as an extended confession as the first step in the long process of rebuilding trust with the public. I can only ask forgiveness from all of my followers on all of my public channels, for my lack of open communication since 10 March and for failing to recognize the vulnerability of any high-profile visual novel release in the international market. I hope to find your understanding and support during this trying time. A Kiss For The Petals – Maidens of Michael will continue to be available on MangaGamer.com. Customers who have difficulty purchasing it are encouraged to contact MangaGamer staff to arrange for alternate payment. Tights Day took place on 2 November 2017. As with previous years, a number of artists shared their illustrations of women in tights on Twitter throughout the day using the hashtag “#タイツの日.” For my own part, I made 622 tweets starting from 11:00 AM EDT on 1 November, which was midnight on 2 November in Japan, until 2:00 PM the following day. 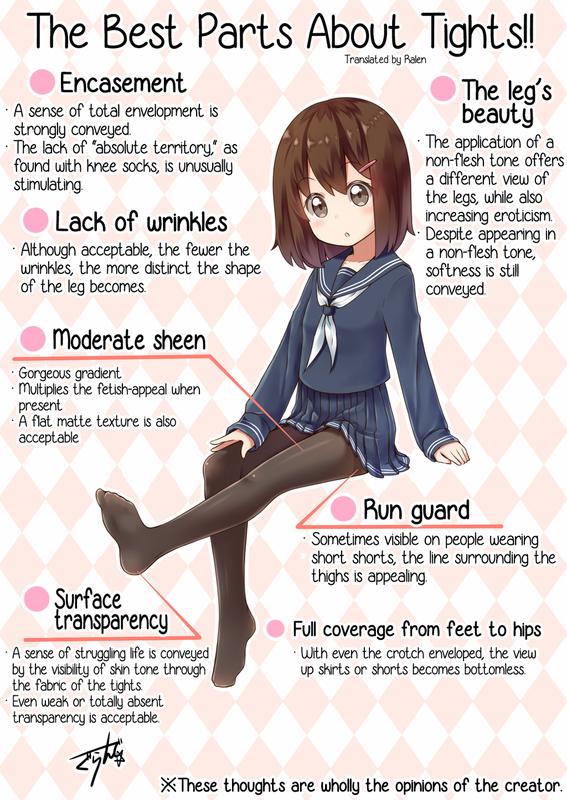 For this year’s occasion, noted artist ぐらんで “Grande” (Twitter: @gggrande, Pixiv) shared an updated infographic detailing “The Best Parts About Tights.” Now in its third edition, “Tights Have All These Good Points!” is far more comprehensive than previous years and covers specific components of the female legs and feet with Grande’s opinions on how their appeal is enhanced by tights across four pages. It includes nearly all information from the 2016 revision with new illustrations. It has been translated by Ralen. “I’ve compiled everything I consider appealing about tights into four pages, along with illustrations. Help me spread the good word about tights! The fourth image above features Lonyan on the left, one of Grande’s original characters, though without her dress. Described as a personification of tights, her name is taken from the Japanese pronunciation of nylon, nairon, with the letters rearranged to ro-nian. 2017 saw the emergence of multiple trends in the portrayal of tights, as well as greater prevalence of female character designs that include tights in popular, highly visible media. It is now common for ensembles of characters that include multiple female characters to have at least one of them in tights. The following is a list of characters that are known for wearing tights and are commonly illustrated by artists in tights fandom. It is neither exhaustive nor comprehensive and will be updated regularly. A Kiss For The Petals – Maidens of Michael was revealed as one of MangaGamer’s license announcements for Otakon 2017 on 11 August 2017. At the presentation, it was labeled as “Secret Project #1,” one of six such projects listed in their convention schedule and project status in February 2017. Projects 2 through 6 were fully revealed throughout the year at previous events, but it was number one that was the most mysterious. Listed as 100% translated and edited since its revelation in February, some have asked why it would be kept a secret even after such progress had been made already. In truth, though the translation had already been completed, work started only this year in all other aspects of the project, including programming and graphic processing. In addition, the translation and editing work were in progress for over four years. In May 2013, six months after the Japanese release of Maidens of Michael on 30 November 2012, unofficial translations of the visual novels were still in development. At my request, series translator Ralen began work on Maidens of Michael after it became clear that only he was willing to undertake such a tremendous endeavor. He would do this even without a guarantee that his work would be later be used for an officially licensed product—at the time, licenses for any A Kiss For The Petals products were a lofty vision, though they have always been the end goal of the unofficial translations. The translation project started as a community effort at Yuri Project, who had collaborated on fan translations of previous visual novels. A number of individuals contributed to this translation in various ways, but it was led largely by Ralen’s own ambition. 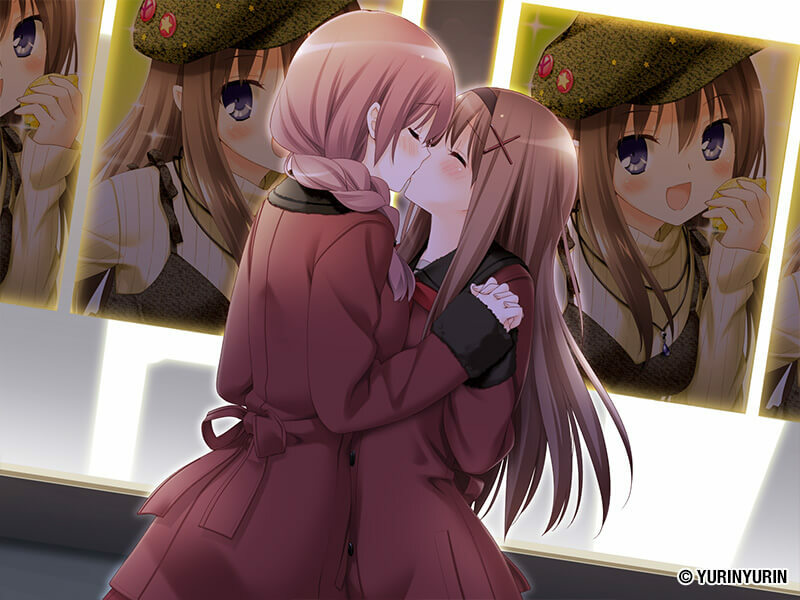 In July 2015, the decision was made to discontinue the public side of the translation in order to focus on our new project with localization company MangaGamer, which would become A Kiss For The Petals – Remembering How We Met. With MangaGamer now responsible for English localizations of A Kiss For The Petals visual novels, we were no longer able to justify publicly supporting works which we are not licensed to work on. However, Ralen and I were committed to finishing our work on Maidens of Michael in secret, without the aid of the community, as we agreed in 2013 that we would do so even if a license for it would never materialize. There were a few hiatuses throughout the four-year period—thank you for supporting us via Remembering How We Met and The New Generation!—and by early 2017, we were able to present our finished work to MangaGamer for consideration. There were some challenges that pushed this reveal into one of the final announcements of the year. However, three keys made this a reality: the existence of a complete, high-quality translation, created over four years on an entirely voluntary basis; the results of the previous two MangaGamer English license surveys, placing A Kiss For The Petals in the top five in 2016 and 2017; and MangaGamer’s continuous efforts behind the scenes to surpass all other obstacles. The existence of Secret Project #1 was made known at the start of this year, and at MangaGamer’s presentation at Otakon last week, I had the privilege of unveiling this secret to the live audience. The onus now falls on me and the rest of the team at MangaGamer to bring four years of work to its conclusion. This will be my largest translation project to date officially or otherwise, larger even than The New Generation. There are many more characters, routes, and images to process for the English version compared to our previous work. I am honored to have the responsibility of bringing the most hotly demanded title in the series to Western audiences at last, and I thank you all for your support which made this a reality. My first trip to Japan was largely centered around a single event, Girls Love Festival 16 on 21 February 2016, as well as for personal reasons that I cannot detail here. Planning began in September 2015, and after a train ride from Narita International Airport to Shinjuku and a 15 minute walk, my travel companion and I arrived in Shinjuku Granbell Hotel. Due to the limited duration of our stay, much of the time spent was divided between the interest of myself and my companion. On the morning of 21 February, I traveled alone by train to Kamata and made my way to Ootaku Sangyou Plaza PiO shortly before the doors opened at 12:00. Courtesy of Kamibukuro Works, I was furnished with an exhibitor pass and a seat at their booth. Kuma Ichigo, a member of Kamibukuro Works, also planned to meet with me, but he was unfortunately unable to attend due to illness. Photography of the event was not permitted, so I do not have any to share. The festival took place in an exhibition hall on the first floor and consisted of many amateur artists selling self-produced yuri works in various forms, largely doujinshi manga, written works, and artbooks. Roughly three-fourths of the hall was occupied by the festival, and activity was constant throughout that space. Several professional companies held panels at the outward-facing end of the hall, including Carnival, the parent company of St. Michael Girls’ School, though no announcements related to A Kiss For The Petals were made. Even so, Carnival’s presentation was partially drowned out by the adjacent company’s showing, which had access to better audio and video equipment. Overall, the atmosphere is comparable to that of an American anime convention’s dealer hall, albeit with a very narrow focus on a single genre. Though the attendance was nearly entirely Japanese, there was at least one non-native, an American teacher I spoke with at the booth. There was also the familiar sight of large amounts of attendees along the wall, some of whom were playing on portable game systems, waiting for nothing in particular. The event ran until 4:00, and in the final minutes, Mi Kara Deta Saba arrived to greet the staff of Kamibukuro Works and me. After the festival, I was invited to join them for an after-event dinner party at a nearby restaurant, joined by another individual who acted as my interpreter. It was truly an honor to meet the producer of A Kiss For The Petals face-to-face, as was hearing his words of gratitude and encouragement for my further works. It would be no exaggeration to say that the significant time and financial investments I made to take this trip were justified on this night. Girls Love Festival was the most central event of my trip. The remainder was spent largely exploring commercial points of interest in and around Shinjuku, and there are a few other thoughts I’d like to recount here. I may write a second post on other minor events at a later date. Suggestions to visit Akihabara were a constant as I informed my acquaintances of my travel plans. Though I had only six days total, no less than two of them were spent in the famous district. The first shop I visited there was a seller of electrical components and devices, and simply browsing it gave me a nostalgic feeling. I made only one purchase, a three-to-two prong electrical adapter for my laptop. I took the opportunity to sample fresh taiyaki—a fish-shaped pastry, in my case filled with strawberry cream—and I regret not buying more. There was the expected abundance of second-hand media markets, and a search for older A Kiss For The Petals works missing from my personal collection turned up the first Extras Roundup. Visiting the game centers was a high priority, as traditional arcades in my area have long since shut down. Shinjuku had several within walking distance of my hotel, two Taito Stations and at least one Sega arcade. The game centers I visited were operated by large video game companies, namely Taito, Sega, and Namco, and all of them were at least three stories tall dividing the machines by type: standard action games, medal pushers, networked games local and nationwide, rhythm games, and UFO catchers, among others. I found my first few visits overwhelming, as it had been many years since I experienced the din of a busy arcade, but after about four visits, the sights and sounds became familiar again. I spent the majority of my time on various rhythm games, and several aspects of them are worth mention. Newer games are equipped with headphone output, but some centers retrofit older machines with headphone output through a splitter box affixed to the side with independent volume control. I found that where available, headphone use improves accuracy. However, some centers showed signs of heavy use of these ports, with all ports on all machines in a single center malfunctioning in extreme cases. In one Club Sega in Akihabara, a Pump It Up Prime – Japanese Edition machine was decorated with a variety of convenience features, such as extension cables from its USB ports, a spray bottle and rag to clean the steps of dust before and after play, and a defibrillator next to the machine. Perhaps not coincidentally, the machine was placed in plain view of a service desk should the defibrillator become necessary, though it was vacant when I played. In the short time I had to explore the country, I was unable to seek out retro arcades to see older games that were not distributed out of Japan; the urban centers I visited had mostly newer and popular games in circulation with some having a floor dedicated to a selection of fighting games. Shinjuku Granbell Hotel is located adjacent to the commercial district of the city, which is surprisingly tranquil before normal operating hours starting approximately 10:00 AM. Having visited New York City in September 2015, I would preemptively compare the character of this part of Shinjuku to the equivalent sector of Manhattan. After businesses open, foot traffic is constant in all parts of the district. A large department store is in view at almost all times, and there is also an underground shopping mall with entrances near Shinjuku Station with its own selection of small to medium stores. Much of these shopping areas were left unexplored by the end of my trip, and by the end of the trip, I had spent a total of $497 (approximately 55,000 yen) over six days, a fraction of the total amount of cash I brought from home and far less than I expected to spend. I do not have a reliable estimate for the amount of cash I spent in game centers, but I believe it to be in excess of 10,000 yen, and I would gladly do so again for the unique experiences they offer. Girls Love Festival 17 is scheduled for 5 June, less than four months after the last. I am currently planning to return to Japan solo from 1-15 June, barring any circumstances that force me to cancel. 2 November was “Tights Day” (タイツの日), a “holiday” imagined by the Japanese clothing manufacturer M&M Socks Co., Ltd. According to their explanation, Tights Day falls on 2/11 as the number 11 resembles a pair (of tights), as does the number 2. November is also the time when women begin wearing tights in greater frequency, although it can be argued that it is actually much sooner. I am contrite to admit that I was unaware of this holiday until the closing hours of the 2015 occasion. 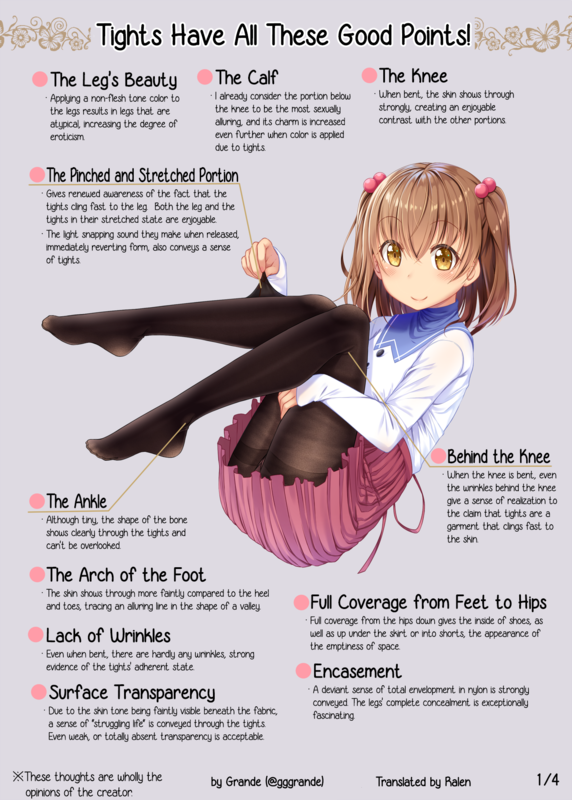 A number of artists shared their illustrations of women in tights on Twitter throughout the day using the hashtag “#タイツの日.” One of the most poignant illustrations was a diagram by ぐらんで “Grande” (Twitter: @gggrande, Pixiv) pointing out “the best parts about tights.” Originally published on 19 April 2015, it details, in Grande’s opinion, the most appealing aspects of tights and how they enhance the appearance of the legs, and by extension, the wearer. Ralen was gracious enough to provide a translation. It is republished with permission from the artist. I have written about what I find appealing in tights in the past, but I have never been able to do so with a purpose-built visual aid such as this. Many of the points above echo what I’ve written in past articles, so I would like to add new findings and amendments to those thoughts here. On 25 September 2015, I announced my involvement as overseer of the English localization of A Kiss For The Petals – Remembering How We Met on the MangaGamer staff blog. Prior to that date, I withheld information about my work on the project due to my own belief that my history with the fan translations would have caused a conflict of interest. I used the skills I developed over many years working on fan translations to develop the English-language version in secret. However, I later learned that my presence in fact encouraged St. Michael Girls’ School to move forward with the license. With that assurance, I wrote the above article detailing my views and history with the franchise, and I will be able to discuss them much more openly in the future. 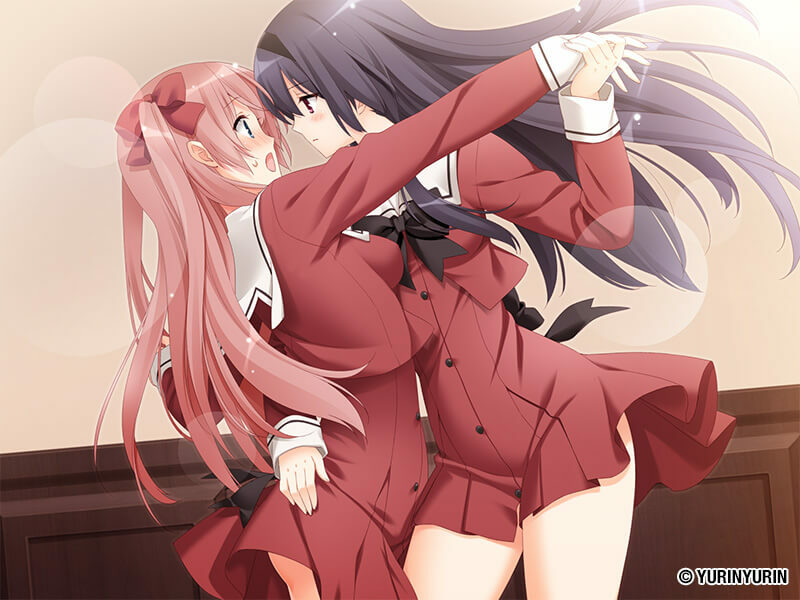 Due to the nature of the partnership between MangaGamer and St. Michael Girls’ School, details on previous releases from Fuguriya and Yurin Yurin, as well as the fan translation efforts, cannot be discussed in an official capacity. This is an unabridged version of my Editor’s Corner post with information on those topics. A complete listing of individuals who worked on the translation patches is located at the bottom of this article. The partnership between MangaGamer and St. Michael Girls’ School represents a significant step forward in the business plan of St. Michael Girls’ School. In light of this, I have deemed it necessary to make significant changes to the administration of Petals’ Garden. Effective immediately, Petals’ Garden will no longer host content of questionable legality and will take greater measures to respect the copyrights of Fuguriya, Yurin Yurin, and St. Michael Girls’ School. Only the visual novel translations are affected as they contained images and code copyrighted by at least one of those companies. The light novel translations contain cover images freely available on Fuguriya’s website and entirely original text. The web page and video content are labeled free to redistribute. Other parties may continue translations of the visual novels, but they will not be endorsed by Petals’ Garden. Update 10 July 2015: Petals’ Garden will also no longer support the translations on Yuri Project, but the translations posted there remain the property of their authors and can be continued at their discretion. The goal of the visual novel translations was to raise awareness of the series as a whole and demonstrate interest in official Western releases. The partnership between St. Michael Girls’ School and a major Western publisher of visual novels signifies that they have succeeded. However, Petals’ Garden was created strictly to promote A Kiss For The Petals, and the responsibility of visual novel translation and distribution now belongs to MangaGamer, the official partner of St. Michael Girls’ School. As I have written in the past, the creators of A Kiss For The Petals have been aware of the fan translation efforts since their inception, but such efforts are now subject to greater scrutiny by all companies involved. For the reasons above, there is no longer any legal justification to continue to distribute them. I apologize for any inconvenience this causes, but as Petals’ Garden is recognized as a major English news source for A Kiss For The Petals developments, this change is necessary to ensure that the partnership will be a success and maximize the chances of future English licenses. I thank you for your understanding of this decision in this crucial time for these two companies. 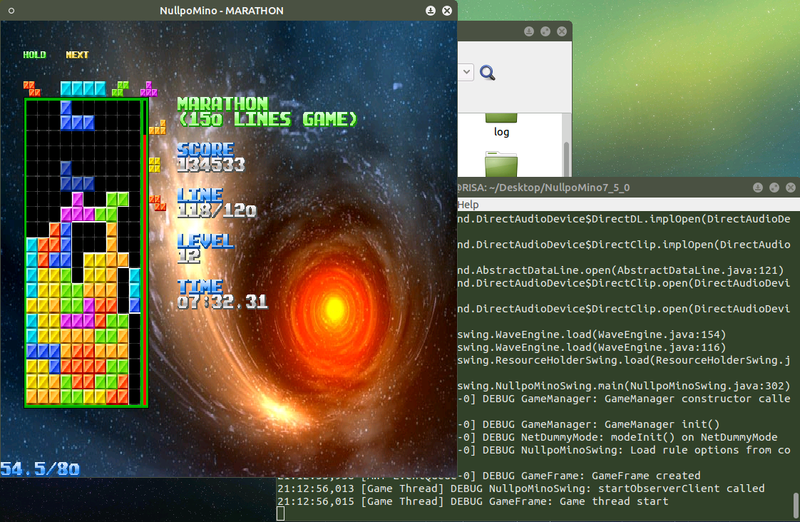 In 2012, I attempted to run NullpoMino on a Raspberry Pi Model B with 512 MB of RAM. In February 2015, the Raspberry Pi 2 was released and boasted substantially upgraded hardware, with a quad-core 900 MHz processor and 1 GB of RAM at the forefront. Ubuntu is supported through a specially-crafted image of Ubuntu MATE, so I use it for my preference of MATE over LXDE and a desire to try a platform other than the default. NullpoMino has not been updated since my previous post, so the setup process was identical, save for the use of the Oracle Java 8 runtime instead of OpenJRE for its superior ARM support. I have overclocked my machine to 1067 MHz CPU, 533 MHz core, and 466 MHz SDRAM with an overvoltage setting of 4 and 384 MB of RAM allocated to the GPU. As before, the SDL and Slick builds do not run as they are only supported on x86 hardware, but the Swing build runs at nearly 60 FPS. The audio issues from before persist here, but the game is fully playable. I will try again with the SDL and Slick builds when Windows 10 is released for the Raspberry Pi 2. This is a sample of a mashup project I had to abort due to the original song’s inability to have the vocals extracted. My sincerest apologies to Anzu Hana and Izumi Ayaka.